Our new password protect WordPress category plugin has been released today. Password Protected Categories lets you protect any type of category in WordPress or make them private. Since the launch of our other plugin, WooCommerce Password Protected Categories, we’ve had lots of requests for a more general password protection WordPress plugin to cover other types of category. You can use the new plugin to protect categories for blog posts and custom post types, which covers all the main types of WordPress category. It can even password protect WordPress categories created by specific plugins (e.g. events or e-commerce plugins). What sorts of categories can I password protect? 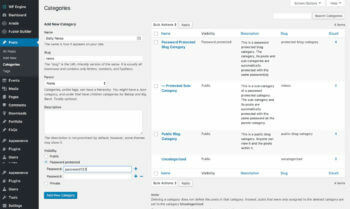 You can use the password protect WordPress category plugin to protect any type of hierarchical taxonomy in WordPress. In layman’s terms, these are commonly known as post categories. They’re different from tags and custom taxonomies because they are hierarchical and you select a category using check boxes. If you select categories by ticking boxes similar to this screenshot then you can protect them with the password protect WordPress category plugin. You can use the plugin to protect categories that are attached to standard WordPress posts or custom post types. This means that it can be used for pretty much any type of categories in WordPress. Here are some use cases to help you think about how it can work for your own website. The most obvious usage for the plugin is to password protect standard post categories in WordPress. These might be used for a blog or news section on your website. Lots of WordPress websites need a private blog while leaving the rest of the website (e.g. the pages) public. Others need to structure the blog posts into a series of public and private password protected categories. The password protect WordPress category plugin lets you password protect entire categories within your WordPress blog, or mark them as private. It automatically protects all the posts within that category, hiding them from your main blog page. As the second most popular WordPress e-commerce plugin, many websites need to password protect WP eCommerce categories. You can either create a private store in WP eCommerce by putting all your products within a password protected category, or marking all your categories as private. Or you can create a hidden area of your online store which runs alongside your public shop. A popular example of this is to password protect a WP eCommerce wholesale store which only authorised trade users can access. Easy Digital Downloads is the third most popular WordPress e-commerce plugin. You can use the Password Protected Categories plugin to create a private Easy Digital Downloads store or password protect WordPress categories in Easy Digital Downloads. This lets you have a completely private store, or separate public and private areas of your online shop. There are lots of other WordPress e-commerce plugins such as WP eStore, MarketPress, JigoShop and Shopp. You can password protect categories in any e-commerce plugin that stores products as custom post types with hierarchical taxonomies. Thousands of websites list events using a WordPress events plugin. Popular events plugins include The Events Calendar, Events Calendar Pro, Events Manager, Events Manager Pro, Event Organiser, Event List and Event Espresso. All of these plugins store events as a WordPress custom post type with categories. Use the Password Protected Categories plugin to password protect events categories in your store or make them private. Only customers with the correct password can access your protected events. How does the WordPress password protect plugin work? You can password protect categories in WordPress by adding 1 or more password. When a visitor tries to access that category, they are taken to a login page. Entering a valid password will redirect them to that category, unlocking the content within. All content (e.g. posts) within a protected category is automatically protected by the password for that category. This means that if someone tries to access a password protected page directly, they will be taken to the category login page. There’s also an option to mark a category as Private. Private categories are only visible to logged in users with the correct privileges. By default, only Administrators can see private categories. You can extend this to other WordPress user roles (or create custom roles) with the User Role Editor plugin. Can I password protect my entire WordPress blog or post type? Yes. 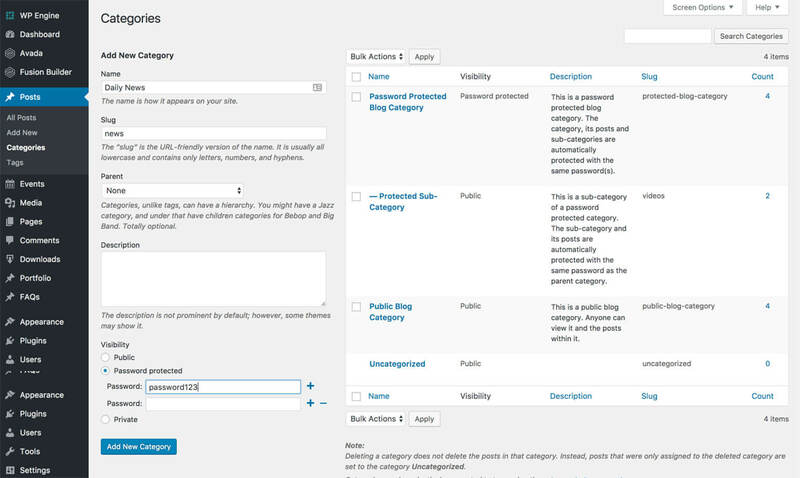 You can create a main ‘Parent’ category for your blog or custom post type, and password protect this. Then put all your posts or custom posts within this password protected category. This will protect all the content within your WordPress blog or custom post type. It’s possible to sub-divide your password protected blog or post type. You can create more complex category structures by adding child categories of your main parent category. Leave them set to ‘Public’ and they will automatically be protected with the same password as the main category. Aren’t password protected categories already part of WordPress? Strangely, no. You can password protect WordPress pages and posts without needing any plugins. But being able to password protect categories has always been a gap – hence the need for a new plugin. We hope the new plugin is useful for you. You can get it from our website. We’d love to know what you think of Password Protected Categories. We’d especially like to hear how you decide to use it on your own website. Please add your comments below. Will this protect links to a media file added to a post? Hi Gavin, the plugin doesn't protect media file URL's. However, if the post that a media file is added to is hidden from public view, then realistically no one else is likely to find the URL.